We are on the brink of yet another change. That sounds dramatic, but it has just dawned on us that time is not standing still and in less than 3 weeks we will be leaving the lovely Casa Magdalena, and the delightful village that has been our home for the past 21 months. Off we go to our new village of Moclín to keep a closer eye on the building works as our brand new home takes shape. Time has crept up on us, mainly because we have filled the last couple of weeks with a trip back to the UK, work and a visit from friends. In fact, this most recent visit from our friends, Tania and Sarah, marked the start of our move; we planned to only start packing once their visit had come to an end. The next week or so will be a round of packing, gradually moving boxes of books and personal items over to Moclín and saying a few farewells to some of the great friends we have met here in The Valley. Of course, it is not goodbye, as we are only moving an hour away, and just the other side of Granada, so we will certainly not lose touch. We have had a rather fabulous weekend to mark the final month of our time in The Lecrin Valley. Tania had been staying in an apartment in Málaga with her Mum, and on Thursday Sarah flew over from London, we met her at the airport and then went and took the place vacated by Tania’s Mum who returned home as planned. For the first time since we have lived in Spain, we were able to spend the night in Málaga and sample some of the delights of the city that can only be enjoyed when you don’t have to drive off somewhere immediately afterwards. What did we do with 24 hours in Málaga? We are all beachy types, so it made perfect sense to dump our bags in the apartment and then hot foot it down to Playa de la Caleta and get something to eat at the Chiringuito Oasis before nabbing a sun bed. We had a delicious selection of small plates and tapas on a terrace overlooking the uncrowded beach before settling down on 4 sun beds partly shaded by the ubiquitous thatched sun umbrellas. Usually, I’d baulk slightly at paying 4€ or 5€ for the use of a sun bed, but whenever we have friends or family come to stay we, too, are on holiday and we were very much in the mood for a relax. One of the things we love about life in Spain is that time becomes so unimportant. In the UK it sometimes felt as though we were wholly governed by time - the time of the bus, the time to start work, the time to leave work, the time we should have dinner…..Time is easy to forget here, and we used as much of that afternoon as we needed to do some catching up in the sun, listening to waves breaking gently on the shore. The views from the apartment that Tania had rented were spectacular, given that the apartment was on the 12th floor of a building a stone’s throw from the lighthouse and the Pompidou Centre. We could gaze down on Playa la Malagueta below and right down the coastline, or over the sparkling sea. After our very chilled afternoon, we got showered and dressed then wandered along the Paseo del Muelle Uno and into Málaga city centre to search out the first of our rooftop bars. There are several rooftop bars in Málaga, but only a couple get consistently good feedback. The first we visited was Batik, which Andrew and I have been to before, and it is a great spot with fantastic views of the Alcazaba de Málaga, mainly because it is right next door! It’s not a massive space, and it is divided into two areas. The entrance is tucked away a little, but you just have to go in and take the lift as if you belong there! Cocktail prices are not too bad either, but the service can be a tad on the slow side, particular when it is busy. The second roof bar we’d recommend is that on top of the AC Hotel Málaga Palacio by Marriott which occupies a fairly commanding position set back off the Paseo del Parque. The terrace at the top wraps around the front of the building, houses a swimming pool, and the views are spectacular - round the side you get views of the cathedral which is practically next door, and to the front you look out over the park to the harbour. (See our previous post to get exact location and pics) The space reminds us a little of the Radio Bar at the top of the ME Hotel on London’s Aldwych but is better in too many ways to list (not least it’s lack of pretention, no minimum spend rules (infuriating!) and the reasonably priced drinks!). So, two places where you can enjoy a sundowner. Where to eat was the next decision, and after trying to get into the small but very well-reviewed La Barra de Zapata (to no avail) we went to the restaurant that Tania and her Mum had visited on a previous evening. Very glad we did too! Kortxo is not large, but it is great fun. We had both a great meal and an equally great time. Our charismatic waiter/host was but one of the lovely aspects of this place, and the food was delicious - cheese lollipops, solomillo de cerdo, a tempura of cheese and pimiento de padrón with a spicy kick, chorizo flambéed in brandy and Flor de alcachofa con sal negra volcánica nepali. This is a restaurant to which we will assuredly return. The next morning, with rather stubborn hangovers, we did little but relax on the beach until the time came for us to drive, en masse, back home to the Valley. On the Saturday morning we went sailing. We have chartered a skippered yacht once before, and we had a glorious time, with high temperatures, clear blue skies and calm waters. Given that we are now in June, and having had a glance at the weather forecast, we rather assumed that conditions would be similar for this trip. Not so. There was a healthy breeze (which is fine, if not essential, for sailing), but it had a wintery chill attached. Clouds resolutely refused to budge until well into the afternoon, the sea was not calm and as we arrived in Marina del Este to board the boat, it started to rain. The start of this summer has not been pretty, and I am delighted to report that, as I write this, summer does, finally, seem to have arrived but we are not holding our breath. Needless to say, under such conditions, poor Tania and Sarah did start to look just a tad green around the gills, and we had to take a few measures to ensure that their experience on the Mediterranean was unforgettable for the right reasons. We managed to find a sheltered bay and dropped anchor, got the bean bags out and lolled on deck, but the weather did put rather a dampener on what was supposed to have been a wholly relaxing jaunt. Never mind. After the wintery-like sail along the coast, the sun came out, so we were able to have yet another spell on the beach., even though the wind still had a chilly sting in it's tail. Lots of drink (with effects that lasted for more than 24 hours), lots of food, and lots of relaxing chat always makes it difficult to say goodbye to our friends and family. On the way to Granada airport to drop Tania and Sarah off, on Sunday afternoon, we drove up to Moclín to show them where we would be living from the end of this year. Andrew and I knew that the builders were due to make a start on the Friday or Saturday, and when we arrived at the house there was little sign that any work had started. 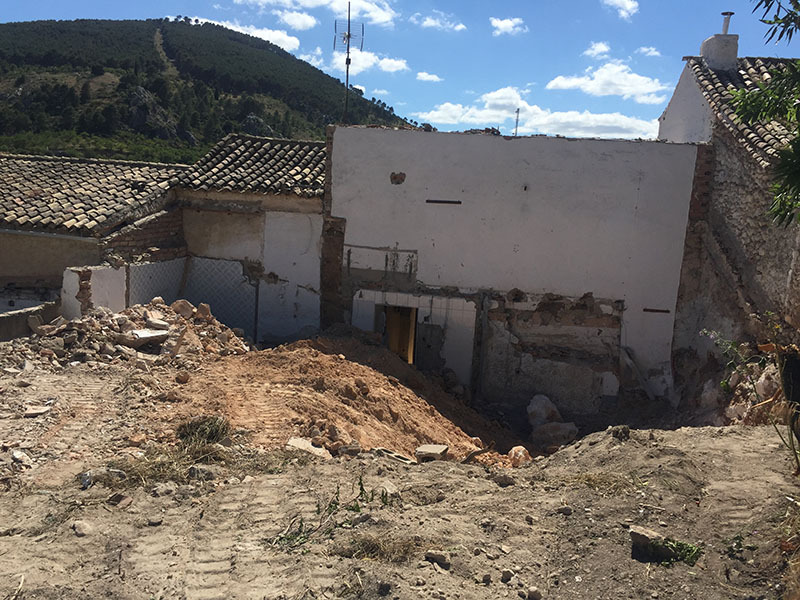 So, when we got the front door open, expecting to see that nothing had changed, it was rather a jaw-dropping moment to discover that the whole of the back of the house had disappeared, and half of the garden had been completely flattened! Only the small 1850’s original cottage remains. A huge hole has been dug at the rear of the house to make room for the footings and the extension. At last, the build has started, and despite the radical change, it was thrilling to finally see progress, and to look at what the views might be from our new terrace. On Tuesday, we have the first of our site meetings with the builder and the architects to assess progress so far, and I expect rock will be one of the topics for discussion. Moclín is practically built on rock, and we have always been aware that the rock beneath may prove problematic as we extend and dig down. Mind you, the initial signs following the builders’ first stage demolition look positive, so fingers crossed. After that lovely weekend, then, we move on to yet another phase of our lives here: the building of our very own home, designed to suit us and the future we envisage. Even though we dragged poor Tania and Sarah across what is now a building site, they made encouraging noises. We got to the airport, unloaded the car and Tania suddenly exclaimed that she had found half a garden wall in her bag. That, and the baby snake that Tania discovered earlier in her bedroom would put some people off ever returning here, but we hope that’s never the case.